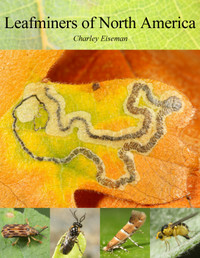 The first edition of my new book, Leafminers of North America, is being made available in 18 monthly installments of PDFs beginning January 2018. For more information including subscription options, click the image to the left. Eiseman, Charley and Noah Charney. 2010. Tracks & Sign of Insects and Other Invertebrates. Mechanicsburg, PA: Stackpole Books. 582 pp. Winner of the National Outdoor Book Award and the Choice Magazine academic book award. Click the image to the left for details or to order a copy. Links are included for open-access publications. If you would like a PDF of any of the others, feel free to email me (most are also available on ResearchGate). Eiseman, Charles S., Owen Lonsdale, and Tracy S. Feldman. 2019. Nine new species of Agromyzidae from North Carolina, USA, with new host and distribution records for additional species. Zootaxa 4571(3): 301–333. Eiseman, Charles S. and David R. Smith. 2019. Prolatus artus Smith (Hymenoptera: Tenthredinidae), a leafminer of Dichelostemma capitatum (Benth.) Alph. Wood (Asparagaceae). Proceedings of the Entomological Society of Washington 121(1): 115–118. Eiseman, Charles S. 2019. A review of natural history data for Nearctic Epermenia Hübner (Lepidoptera: Epermeniidae), with the first account of the larval habits of E. albapunctella Busck. Proceedings of the Entomological Society of Washington 121(1): 107–114. Eiseman, Charles S. and Owen Lonsdale. 2018. New state and host records for Agromyzidae (Diptera) in the United States, with the description of thirty new species. Zootaxa 4479: 1–156. Eiseman, Charles S. 2018. Larval habits of Batrachedra concitata Meyrick (Lepidoptera: Batrachedridae), a leafminer of Agave (Asparagaceae). Proceedings of the Entomological Society of Washington 120(3): 642–647. Eiseman, Charles S., Kai Heller, and Björn Rulik. 2018. A new dark-winged fungus gnat (Diptera: Sciaridae) mining leaves of Clintonia borealis (Aiton) Raf. (Liliaceae). Proceedings of the Entomological Society of Washington 120(3): 500–507. Eiseman, Charles S. 2018. A new host plant and parasitoid record for the snapdragon plume moth (Stenoptilodes antirrhina (Lange)), with a summary of records of leafmining in Pterophoridae (Lepidoptera). Proceedings of the Entomological Society of Washington 120(2): 452–457. Eiseman, Charles S. 2018. New rearing records for muscoid leafminers (Diptera: Anthomyiidae, Scathophagidae) in the United States. Proceedings of the Entomological Society of Washington 120(1): 25–50. Eiseman, Charles S. and Donald R. Davis. 2017. A new species of Macrosaccus (Lepidoptera: Gracillariidae: Lithocolletinae) from Arizona, USA. Zootaxa 4358(2): 385–392. Eiseman, Charles S. and David R. Smith. 2017. Nearctic Species of Metallus Forbes (Hymenoptera: Tenthredinidae): Biology and Distribution. Proceedings of the Entomological Society of Washington 119(4): 551–564. Eiseman, Charles S., Donald R. Davis, Julia A. Blyth, David L. Wagner, Michael W. Palmer, and Tracy S. Feldman. 2017. A new species of Marmara (Lepidoptera: Gracillariidae: Marmarinae), with an annotated list of known hostplants for the genus. Zootaxa 4337(2): 198–222. Smith, David R., Julia A. Blyth, and Charles S. Eiseman. 2017. Nematus appalachia Smith (Hymenoptera: Tenthredinidae) feeding on Fagus grandifolia (Fagaceae). Proceedings of the Entomological Society of Washington 119(3): 518–519. Smith, David R. and Charles S. Eiseman. 2017. A new species of Fenusa (Hymenoptera: Tenthredinidae) mining leaves of Rosa woodsii Lindl. (Rosaceae) in North America. Proceedings of the Entomological Society of Washington 119(2): 233–238. Eiseman, Charles S., David R. Smith, and Mark J. Leoschke. 2017. Host, larva, and life history notes for Macrophya nigra (Norton) (Hymenoptera: Tenthredinidae). Proceedings of the Entomological Society of Washington 119(1): 142–145. Eiseman, Charles S., Tracy S. Feldman, Eric F. LoPresti, and Michael W. Palmer. 2017. First North American records of Porphyrosela minuta Clarke (Lepidoptera: Gracillariidae), with notes on its native congener, P. desmodiella (Clemens). Proceedings of the Entomological Society of Washington 119(1): 18–23. Eiseman, Charles S., Kai Heller, and Björn Rulik. 2016. A new leaf-mining dark-winged fungus gnat (Diptera: Sciaridae), with notes on other insect associates of marsh marigold (Ranunculaceae: Caltha palustris). Proceedings of the Entomological Society of Washington 118(4): 519–532. Eiseman, Charles S. 2016. North American leafminers (Lepidoptera: Gelechiidae, Momphidae) on the evening primrose family (Onagraceae): new host, parasitoid, and distributional records. Proceedings of the Entomological Society of Washington 118(4): 510–518. Buhl, Peter N. and Charles S. Eiseman. 2016. Three new reared species of Platygaster (Hymenoptera, Platygastroidea: Platygastridae) from the United States. International Journal of Environmental Studies 73(6): 1006–1015. Hespenheide, Henry A. and Charles S. Eiseman. 2016. A new species of Brachys Dejean, 1833 (Coleoptera: Buprestidae) from the eastern United States using an unusual host. The Coleopterists Bulletin 70(2): 335–340. Eiseman, Charles S. 2016. Notes on the larval hosts and habits of some North American Eriocraniidae and Acanthopteroctetidae. Journal of the Lepidopterists’ Society 70(1): 79–81. Hartop, Emily A., Maria A. Wong, and Charles S. Eiseman. 2016. A new species of Megaselia Rondani (Diptera: Phoridae) from the BioSCAN Project in Los Angeles, California, with clarification of confused type series for two other species. Proceedings of the Entomological Society of Washington 118(1): 93–100. Eiseman, Charles S. and Emily A. Hartop. 2015. A new species of Megaselia Rondani (Diptera: Phoridae) reared from a Macrodiplosis Kieffer (Diptera: Cecidomyiidae) gall on black oak. Proceedings of the Entomological Society of Washington 117(4): 463–466. Eiseman, Charles S. 2015. Notes on leaf-mining Chrysomelidae (Coleoptera) in New England. The Coleopterists Bulletin 69(3): 453–458. Eiseman, Charles S., Julia A. Blyth, and David R. Smith. 2015. Notes on four anemone-feeding insects in the eastern United States (Diptera: Agromyzidae; Hymenoptera: Tenthredinidae; Lepidoptera: Noctuidae). Proceedings of the Entomological Society of Washington 117(3): 281–289. Eiseman, Charles S. 2015. Oenothera pilosella (Onagraceae): First larval host record for Dietzella zimmermanni (Gyllenhal) (Coleoptera: Curculionidae: Ceutorhynchinae) and Altica pedipallida Lesage (Coleoptera: Chrysomelidae: Galerucinae: Alticini). The Coleopterists Bulletin 69(2): 202–204. Eiseman, Charles S. and Andrew S. Jensen. 2015. Insects feeding on sea lavender (Plumbaginaceae: Limonium carolinianum [Walt.] Britt) along the New England coast. Entomological News 124(5): 364–369. Smith, David R. and Charles S. Eiseman. 2015. The violet leafmining sawfly, Nefusa ambigua (Norton) (Hymenoptera: Tenthredinidae): distribution, hosts, larva, life history notes. Proceedings of the Entomological Society of Washington 117(1): 70–72. Eiseman, Charles S. 2015. On the distinctive feeding pattern of Sterictiphora Billberg (Hymenoptera: Argidae) sawfly larvae. Proceedings of the Entomological Society of Washington 117(1): 65–67. Eiseman, Charles S. 2014. New host and distributional record for Dichroram­pha incanana (Clemens, 1860) (Tortricidae: Olethreutinae). Journal of the Lepidopterists’ Society 68(4): 295–296. Eiseman, Charles S. 2014. New host records and other notes on North American leaf-mining Chrysomelidae (Coleoptera). The Coleopterists Bulletin 68(3): 351–359. Eiseman, Charles S. 2014. Notes on the larval habits and parasitoids of Rhopobota dietziana (Kearfott, 1907) (Tortricidae: Olethreutinae). Journal of the Lepidopterists’ Society 68(3): 218–220. Eiseman, Charles S. 2014. Orchestomerus wickhami Dietz (Coleoptera: Curculionidae: Ceutorhynchinae) reared from leaf mines in Virginia Creeper (Parthenocissus Planch., Vitaceae). The Coleopterists Bulletin 68(1): 158–160. Eiseman, Charley. 2013. “‘Finicky’ feeders: specialized insects all around us.” Wild Ones 26(2): 1–10. Eiseman, Charley. 2013. 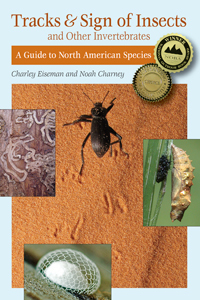 “‘Finicky’ insects: specialized feeders all around us.” In Michael Dover, Caroline Hanna and Rebecca Reid (eds. ): Earth Matters: Essays on the Nature of the Pioneer Valley. Amherst, MA: Levellers Press. Eiseman, Charley. 2006. “Lessons from a bobcat’s trail.” Natural New England 28: 52–55. Horowitz, Alexandra. 2013. On Looking: Eleven Walks with Expert Eyes. New York: Scribner. 308 pp. Horowitz, Alexandra. 2016. Being a Dog. New York: Scribner. 368 pp.